Ford's already proven the lightweight aluminum 2015 F-150 is up to the challenge of desert racing, but they're holding out on releasing a Raptor off-road variant. 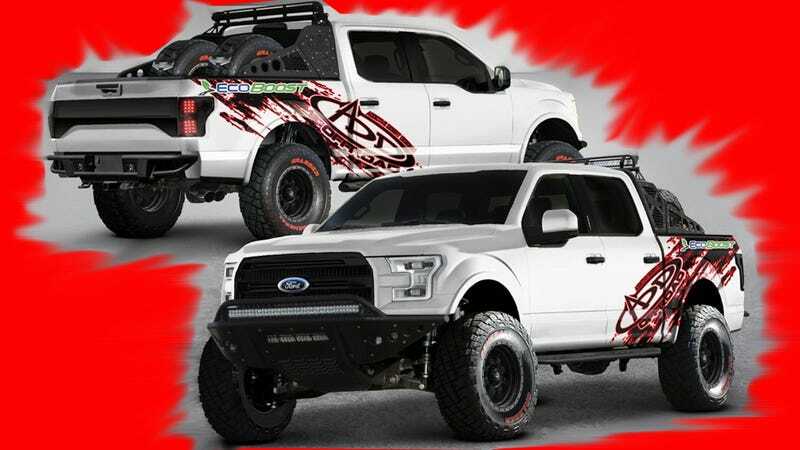 If you can't wait, Addictive Desert Designs has stepped up to fill the gap with two "Baja kits" that should unlock the new truck's rough-country potential. Race-Dezert's Matt Martelli caught a glimpse and says the ADD 2015 F-150 is 7" wider than the standard version, with as much as 13" of suspension travel in front and a whopping 18" in back. With complete kit base prices around $30,000, an ADD prepped 2015 F-150 is in the AEV Brute cost bracket. Worth it to get a jump on off-roading Ford's new pickup? The kits were both collaborative projects with Ford; meaning the Blue Oval supplied the truck and ADD did the modifications on their own dime. ADD says they built on what they've learned from working on Raptors over the past five years and improved on a lot of the components with this kit. They also built the "Deegan 38" off-roader that the XT and XTR will share a booth with at SEMA. The XT keeps shocks in the factory position so the bed is still usable, the XTR's rear pumpers are so big you're basically giving up all cargo capacity. "Baja XT is an under the bed shock kit with less rear wheel travel at about 14" and one called the Baja XTR for the more extreme version. This one has a bed cage and shocks that go into the bed to deliver 18" of travel in the rear." "They both share our full fabricated front suspension system which consists of full fabricated lower and upper arms and full fabricated replacement spindle. The truck is 7" wider than the normal 2015 F150 and both have about 12" front wheel travel with Fox Shocks all the way around. We also use a Fox bump stop in the rear for bottom out protection with a custom built mounting kit that is all 100% bolt on."